The only time I think I'd unfold my arms would be for a GOONIES machine. There, said it. it's marginally better than "def sabbath" or some other rock band theme. I'd rather see a tarantino movie or breaking bad, or even The Magic Roundabout. Are you referring to discgate? Yes, I'd love to see a Clangers pin. That's the best idea I've heard for a game in ages. Pretty unlikely anybody outside of the UK will of heard of the show mind. 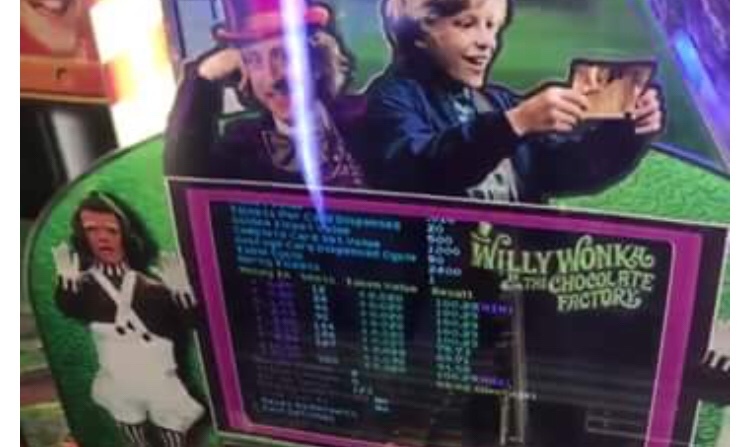 Yeah it was posted elsewhere but I played the wonka machine in Austin (it makes a fortune!) thought I might see what folks thought given the runaway success of WOZ judging by the PMs etc a few of you thought it might be Pinball apparently JJP has the rights to make wonka but no idea if that’s true and hopefully it isn’t - it’s a ****e movie. - it’s a ****e movie. That's a fond memory from my childhood you're bashing there Neil. Sorry mate but it's a 70s classic! The possibilities are almost endless! Can't see Stern picking up the license though, but we can live in hope. Kicking Len up the ****. Father Ted is a racist. There's a flash image of a chicken being beheaded, isn't there? Or something like that. You'll get to see and Play Kill Bill at UKPinfest. Ditto. Certainly has a dark side. More appealing theme than POTC . There's a flash image of a chicken being beheaded, isn't there? Indeed! Great movie and I know pretty much all the words to it. Sad, but true. Who didn't want to drink double-bubble-Burp-a-cola? Who didn't want to drink double-bubble-Burp-a-cola? I'm going to say probably @Neil McRae ! About as appealing as WoZ ...in other words not at all! Wonka pin would be awesome! The film is a piece of history.. a classic! dallas, the a-team, chips, battle star galactica, simon & simon and so on. There are tonnes better themes than Willy Wonka - there are some absolute cult film that haven't been done that could be revisited.